You want to spend some quiet time with your mind, but you have excuses. Take a moment to examine them. They might not be such a big deal. Many of us think of trying meditation, but it can be hard to know where to begin. In Mindful’s Getting Started series, we’ll show you how to start meditating, feel better, reduce stress, and enjoy life a little more. While we might want to try meditation, it can sometimes be difficult to find the time, to be able to sit still, or to keep the mind from racing. 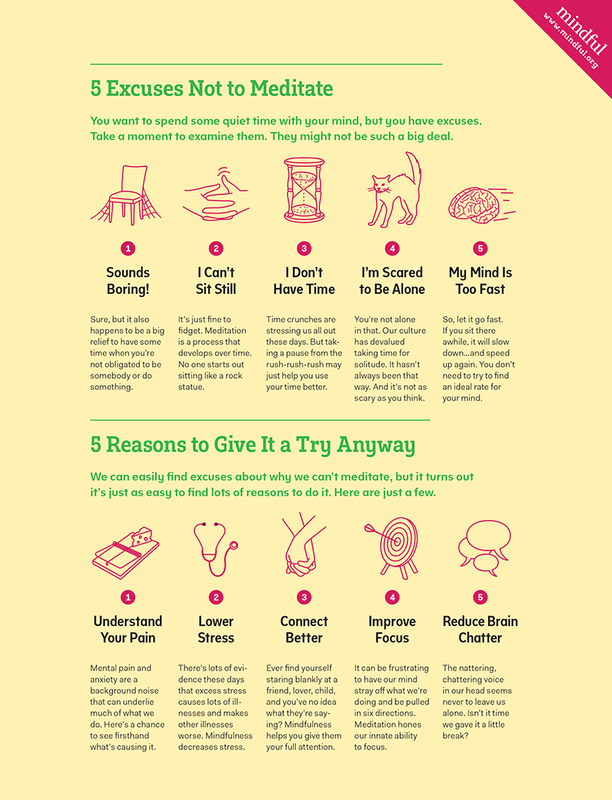 The chart below asks you to examine some reasons you might have for not trying meditation, and lists a few benefits you could realize if you do try. Lower stress: There’s lots of evidence these days that excess stress causes lots of illnesses and makes other illnesses worse. Mindfulness decreases stress. Connect better: Ever find yourself staring blankly at a friend, lover, child, and you’ve no idea what they’re saying? Mindfulness helps you give them your full attention.